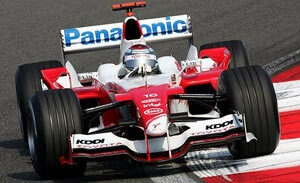 As a part of the continuous development programme at Toyota, the team introduced the TF105B, an evolution of the TF105 that ran all the 2005 Grand Prix, except the for the last two, at Japan and China. This car was the basis for winter testing and introduced a zero-keel front suspension, contrary to the single keel layout of the TF105. The new suspension has mainly areadynamic advantages as the air under the nose is allowed a cleaner flow. The same suspension type was carried over to the TF106 that debuted at the end of november 2005. It was however not until the Toyota TF106B that the keel would be removed and make full advantage of the single keel setup.